Precious was only 8 months old, was living on the streets, and had been terribly abused. When I heard about her, I took her into my home right away. That was in May 2013. I was a little fearful at first, being I had three small dogs, but as you can see from this video (taken just one week after she moved in) things are going wonderful! I started rescuing both people and pets 14 years ago, after an abused, runaway dog that I didn’t want, came into my house and worked his way into my heart! That dog changed my life, healed me, my entire family, and so many others. I know for a fact that rescues are the best dogs in the world. They just want to have a place to call home and be loved. I guarantee they will bring you entertainment, laughter, and joy unspeakable, not to mention companionship, loyalty and love! Please rescue and adopt today–change the world–by saving a life! The call couldn’t have come at a busier time. I had just started teaching our spring AKC Star Puppy, Canine Good Citizen, and Pet Therapy classes. Besides that, I already had three dogs of my own, which I was working with on agility and more advanced training. Wow! Rescuing another dog? My husband will flip out for sure. With so many people always calling, emailing, or texting me about concerns with dogs, it was hard to always remember who was who. As she rambled on, I finally recognized the woman’s voice as Diane, a lady I had met at church who had five darling daughters. I had helped her after one of her dogs was hit by a car. Of course I asked the usual questions, how big the dog was, what breed, age, and if they had any idea where this dog might belong. We’d rescued a husky before, but had never dealt with a Border Collie. I had some concerns about her size and temperament, but Diane said she was great with all her kids and even her cats. Inside, I had this driving passion to go and get her and bring her home. But I also had to be reasonable. I already had three small dogs; a teacup Yorkie, a Miniature Pinscher, and a Jack Russell, and I didn’t want anything to happen to them just so I could rescue another dog. Fostering is rarely ever easy, as I knew from experience. Any time you bring another dog into the house, even with other well-trained dogs; there is still always some sort of confrontation, aggression, behavior, or jealousy to work through. Also, there was no telling where this dog came from or what type of abuse she may have encountered living on the streets for that long. This couldn’t be my husband. He was always dead-set against any new dog coming into our home, even well trained good dogs. I couldn’t believe how excited he got. But then again, he loved bigger dogs. We picked “Precious” up that afternoon. She was way more beautiful than any of the pictures we had seen. Her white and tan markings amidst her black shiny coat looked as though they were painted on in all the right places. Giving kisses, she jumped right into the van and even behaved well on the ride home. At home, though, it was another story. I expected the barking, even the growling and some chasing, but not the restlessness. She paced back and forth, from one door to the other, and to every window, panting heavily, whining, and searching for a way out. In between that, she would hunt our dogs down. At first, I wasn’t sure if she was being aggressive or just wanted to play, so we kept a close eye on her, with a leash attached to her collar so we could correct any negative or aggressive behavior. Later, when I put her on the chain to go outside, she barely stepped out the door, and then wouldn’t leave the porch. She stared out at the yard anxiously, frantically, whining, with her whole body shaking. She followed me, did her business, and then we both returned to the house. That same day I placed an ad in the newspaper in the lost and found section. I had mixed emotions; I wanted to find her owner, but not if they had abused her. So I prayed for God’s will. The entire week the ad ran we received no calls. Even though her bad behaviors remained consistent, I loved her, cared for her, exercised her, and gave her the extra special attention I thought she needed. I also made an appointment at the vet to bring her up to date on all her immunizations. He wasn’t kidding. Those first few weeks were rough. I started to think I had made one of the biggest mistakes of my life. All four dogs were in constant turmoil. And poor Precious she had so many fears; she was always on guard, and she still wouldn’t leave the porch without help. Then something amazing happened; I saw it with my own eyes! My four pound Yorkie and this forty pound Border Collie/Husky mix were engaged in a playful game of tug-o-war. I was afraid at first, thinking I’d have to intercept and save “Lover,” my Yorkie. But Precious didn’t pull aggressively, like she normally did with us, by nearly pulling our arms off; she simply stood there, holding the toy squirrel in her mouth, while Lover pulled and growled with all his might. Hilarious! I never laughed more hysterically in all my life. From there, things actually began to get better, the house settled, and Precious started to overcome all of her fears. I began working with her and using her in my dog training classes too. She caught on quickly and did all the obedience commands like a pro, even the advanced commands. No one could believe it, not even me! One beautiful summer night I took Precious out for a walk. It was just getting dark when we approached a man sitting way up high in a wheelchair. Precious jumped up at the man’s side, softly put one paw on the chair, and patted his chest with the other. I could now see how crippled the man’s hands and feet were, but a big smile lit up his entire face. He even chuckled as we walked away and thanked me for bringing her by. Tears stung my eyes as hope gripped my heart. That night I learned that this dog I rescued from the streets was really, an angel, sent by God to rescue others. Lisa Freeman is CEO of Abuse Bites, Paws for Healing, and A Time to Heal. She is also a lifelong Abuse Survivor, Award-Winning Author, Motivational Speaker, and an AKC Evaluator, Dog Trainer, and Certified Pet Therapist. For more information on dog training, school assemblies, church seminars, and other community events, please log onto http://www.DogsPawsForHealing.com and http://www.AbuseBites.com. I’d been having a dream about getting a female dog for our anti-bullying program. We already had Snickers, a small, male, Jack Russell mix, we had rescued and adopted off the streets six years earlier. He was phenomenal! After only ten days of training he passed his Canine Good Citizen Test and became a Certified Pet Therapy Dog with Therapy Dogs International. He also caught on quick and learned several tricks for our program. In my dreams, for the past few nights I saw a female dog just like him. I told my husband, John about it, and of course, he had the perfect solution. On our anniversary, just a week later, John came home from work and said he was taking me out to breakfast. I got all ready, applied some make-up, curled my hair, and dressed up. Once we were in the van, he sprang the news on me. I didn’t care what he said. My mind was made up. I wasn’t getting one of those demon dogs even if the man was giving them away. I knew from experience that those three breeds were some of the hardest to train, they barked a lot, and had a tendency to be meaner than other dogs. Besides, the dog in my dream looked and acted like Snickers. I agreed, she was tiny, soft and cute, and didn’t look anything like her mother and father, which was a good thing. But she didn’t look anything like the dog in my dream, either. Then the guy began telling us about her. “She was born on 7-7-07…” he said, and rambled a bunch of other stuff off. John looked very surprised but hurried up and paid the man before I could change my mind. Once we were in the van, he started this, “I told you so,” speech. He was soon eating his words. Soon, after we got home, and many months to follow, I couldn’t help but think we’d made the biggest mistake of our lives. Baby Ruth wasn’t anything close to perfect. She chewed up everything; cell phone charger wires, I-pod wires, computer cords, shoes, and anything else she could sink her milk-bone puppy-dog teeth into. She wasn’t potty trained either. Even though we took her out several times a day she still piddled and left a few Linkin Logs all over the house, and when we took her to events or other places, she’d often leave her markings there as well. I felt terrible for her, because later I did the math and found out that her breeders actually gave the pups away when they were just 4 and 5 weeks old, so they all suffered from detachment syndrome and were very fearful. The other thing that made her hysterical is that a small child had mishandled her when she was a young puppy, as well as she’d been attacked twice by bigger dogs when we were out on a walk. But that still didn’t change the fact that she was out of control and I didn’t know what to do with her. I never worked with a dog so hard in my life. That’s what frustrated me the most. It didn’t matter what I did, how many treats I gave her, she’d still run away when I called her name. She was nothing like Snickers or that dog in my dreams. She was more like a nightmare! One day the front door opened and Baby Ruth bolted out of the house and darted across the street. Thankfully, we live on a deserted dead end road with little traffic. Still, she was out of control and ran all over the neighborhood. For a half hour, I zigzagged through yards, across streets, with her leash in hand, traipsing behind her, trying to lure her to me with a treat. She kept going, like she didn’t even hear me. I held my breath and watched in fear. Moments later she made it safely across the street and then hobbled down the sidewalk toward home, leaving a trail of blood behind. I ran after her as fast as I could and scooped her carefully up into my arms and just sobbed. “Why don’t you mind me, girl? Don’t you know that I love you?” I prayed for her all the way home, as I held my hands over her wounds to stop the bleeding. Thankfully, after a trip to the vet, Baby Ruth only suffered minor injuries, and a slight blind spot in her left eye from the impact. I felt relieved, yet concerned. Part of me wanted to get rid of her right then for her own safety, but something deeper inside told me to take Brian’s advice, so I started working even harder with her. I’m so glad I did. Shortly after that tragic experience, Baby Ruth started coming to me when I called her, she learned all the obedience commands, she was soon completely housebroken, and she stopped chewing things up. Even better, she learned the tricks for our program and began doing an awesome agility course. Today we use her remarkable story of change in dog training sessions, as well as our anti-bullying program, to show that bully dogs and bullies can change with the right love, discipline and training. At the end of each anti-bullying workshop, Baby Ruth jumps over a series of hurdles both high and low, dives through hoops and tunnels, and does this cute little dance that brings smiles and laughter to all. Baby Ruth is phenomenal! I thank God every day for bringing her into my life. She is my dream dog, a dream come true! 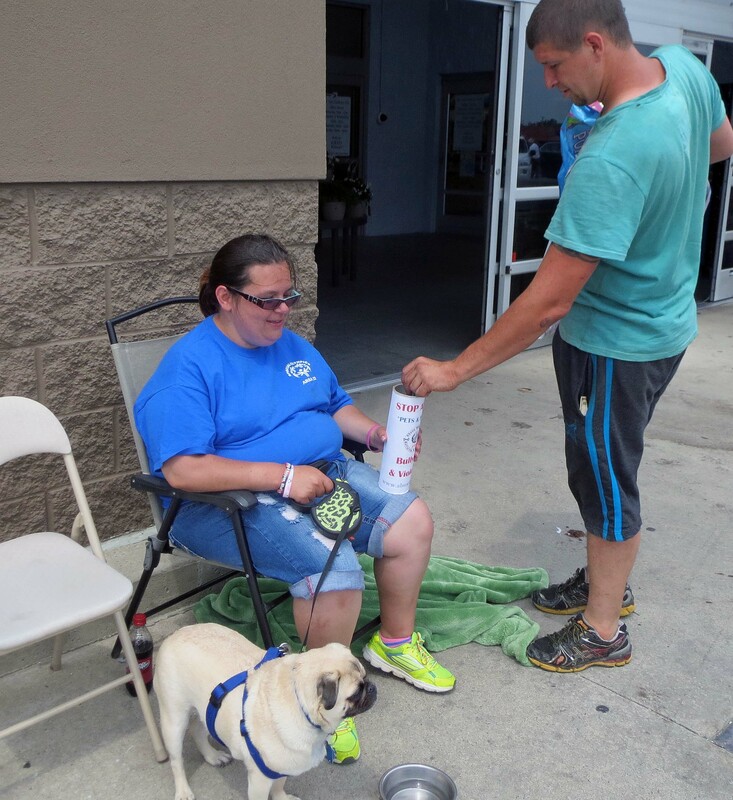 Yesterday we were blessed to have help at Walmart by many of our two-legged and four-legged friends. Tara Albring and Otis (above) have volunteered at each of our events all summer long. They are real troopers. Many times they stay for four hours or more. They are a great team and we are blessed to have them. Thank you Tara and Otis, because of your dedication and support (as well as those who contribute to this cause) we can keep our training fees to a minimum and also travel abroad to rescue people and dogs from abusive situations and set families free! We know that God uses both our two-legged and four-legged paws each day to bring healing and hope to others! Lisa Freeman is the CEO of Abuse Bites, Paws for Healing, and A Time to Heal. She’s also a Lifelong Abuse Survivor, Award-Winning Author, Motivational Speaker, and Dog Trainer from Owosso, Michigan. For more information on school assemblies, community seminars, anti-bullying rally’s, trick presentations, dog training sessions, dog training tips, or rescues and free resources, please log onto her websites @ http://www.DogsPawsForHealing.com andhttp://www.AbuseBites.com. 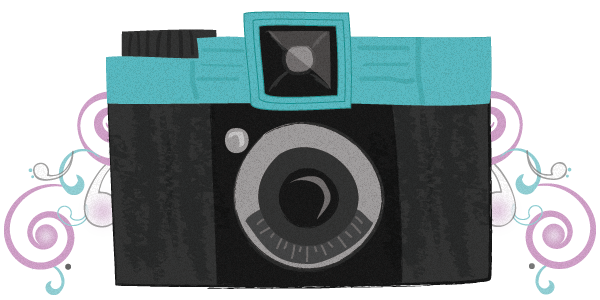 We will be having new contests coming soon. So please keep checking back regularly! 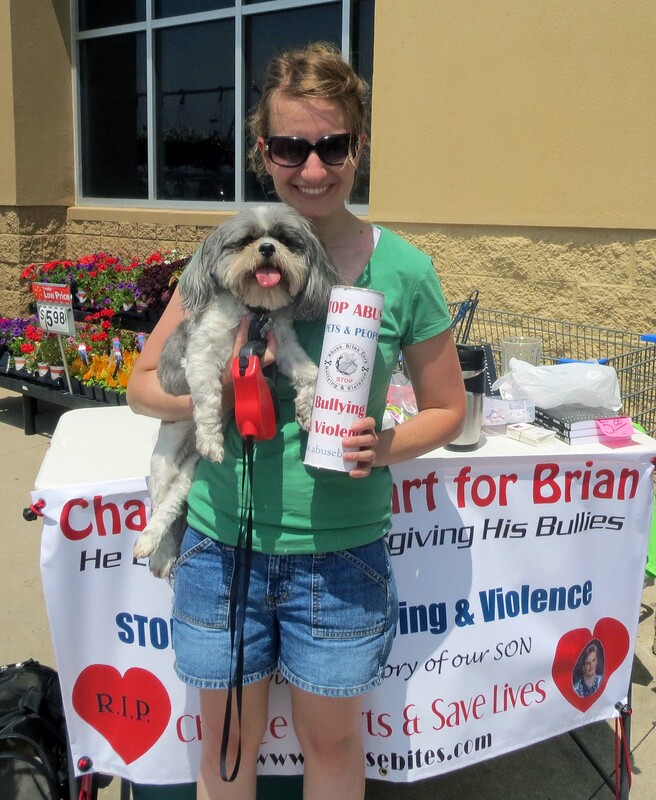 This weekend we are once again out at Walmart in Owosso to raise funds for the Abuse Bites/Dogs Paws for Healing Program. The dogs are a great help in this cause and draw a lot of attention. So thankful for these paws. Together we have a lot of fun with our friends like Joy Mc Phearson and her Shitzu, Ike, who will be helping us today and tomorrow. Thanks! God bless! Have a great day with your canine friend! More training tips and inspirational stories coming soon! So stay tuned. Precious (above left) is our 1 year Border-Collie/Husky Rescue Dog we took into our home this spring. 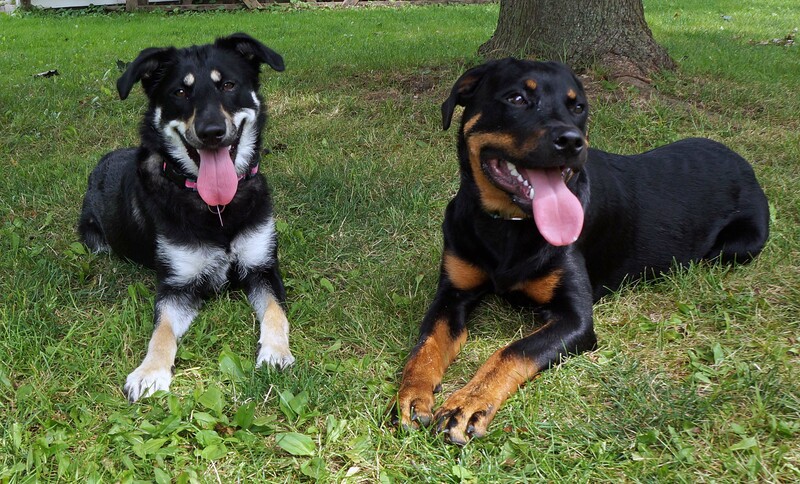 Her new friend, Stella (above right) is a full-blooded Rottweiler. Stella’s owner brought her to me for advanced training so she could pass the AKC Canine Good Citizen Test. After just two training sessions, she passed with flying colors! Even better, my pup got to play with someone her own size for a change! The advantages of being a dog trainer is that I get to work with a variety of great people and dogs, so my dogs are constantly being trained and socialized as I bring them into the training program. After our interactive training sessions, we allow the pups to play chase and romp or play a game of fetch with them. Play is so important when training. If all you do is work on training your dog and don’t allow them the play time they need, they can become bored, stubborn, or even aggressive.Training is a delicate matter. So, I do commend Stella’s owner for all the hard work and training he put into her. She was very aggressive when he bought her, so he got a good deal on her. His friends at the police K-9 unit wanted to buy her, said she was perfect for their team. But he knew Stella was meant for him, so he worked very hard on her aggression and retrained her to be the loving, obedient wonderful pup she is today. When she came to her first training here, she had a few quirks that needed to be worked out, such as “leaving it” (food on the ground), and staying with a safe stranger for the required three minute supervised separation, and wanting to play when I held her front paws. By the very next day, she did everything perfect and passed her test! Smart dog. And an excellent owner who understands a little training, mixed with a lot of play time, goes a long way. Just like dogs, we enjoy our play time and might need aggression training too if someone took the fun out of our life. A dog and owner who plays together stays together. Have a great night and enjoy your canine friend! Lover only weighs four pounds, but his tiny paws pack a powerful punch. At only a year and half old he has passed his AKC Canine Good Citizen test, he’s a Certified Pet Therapy Dog through Love on a Leash, he is a Service Dog, and also the new Mascot for the Abuse Bites–Paws for Healing educational program that presents educational anti-bullying programs in schools, churches and communities. He’s even learning some neat tricks and agility. 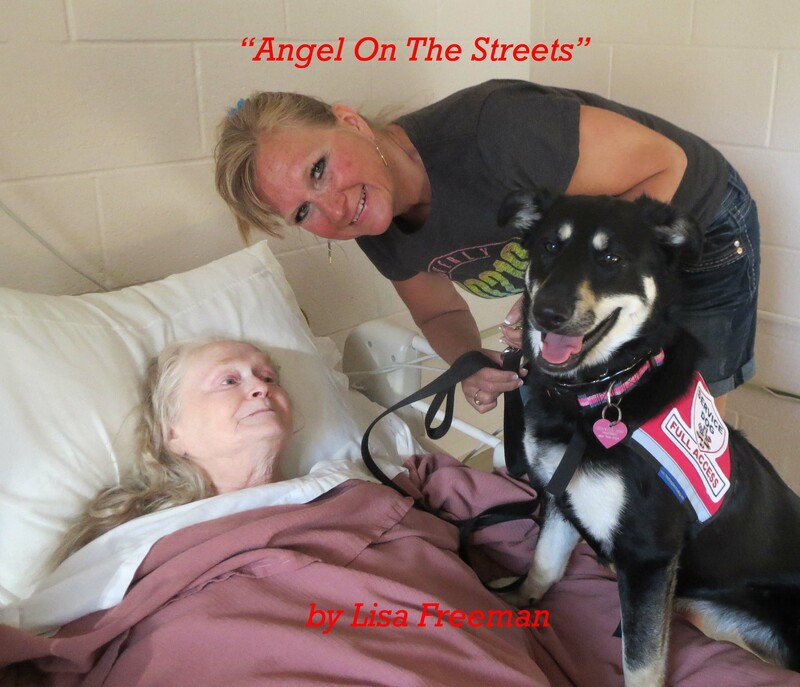 Famous Author and Speaker Carol Kent interviews budding Author and Speaker Lisa Freeman about her inspiring story of how a runaway abused dog she never wanted rescued her, her family and so many others. Together they now do Paws for Healing workshops and assemblies in schools, churches and communities to educate on love, kindness, acceptance, etc to stop abuse, bullying and violence of both people and dogs. They also do rescues, and recently took a Border Collie into their home that was living on the streets for months. 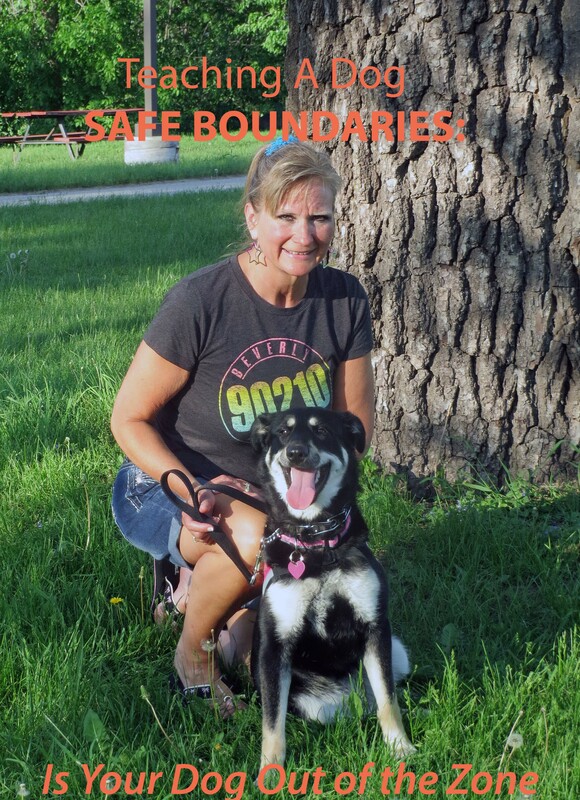 SAFE BOUNDARIES: Is Your Dog Out of the Zone? Lately I’ve been trying to train our very hyper one-year-old RESCUE dog, Precious, a Husky/Border Collie mix. We’re working on safe boundaries. Although I’ve had ten years of experience working with some of the most difficult pups and aggressive dogs, Precious has been one of my greatest challenges. The problem; she has lived on the streets all of her life and shows many signs of being abused. When we first took her into our home she paced restlessly back and forth from one door to the other. Going outside on the chain was another story. At first, she wouldn’t leave the porch. I had to step outside with her and coax her down the steps and into the yard. Now, after three months of being in our home, the restlessness has stopped, and with just a verbal coaxing from inside the house she will now go out into the yard by herself. She loves to bolt when the front door is opened. She’s been taught to stay back from the door, but every once in awhile when the door is left open, out she runs. Although she has mastered all the advanced obedience commands and training, she still has a wild nature about her and runs the first chance she gets. As her foster parent I fear that she will run into the path of a car at some point if we cannot establish safe boundaries. Right now I’m working with her on our yard boundaries. I’m walking her along our property line on a long loose lead. I leave the lead on the ground for the most part, but I’m prepared to grab and give a correction if she should start to step out of bounds. I’m also using a bag of treats and a ball to teach her through a fun play time of fetch in the yard. I throw the ball, tell her to “get it” and “bring it”. She used to fetch fine, but liked to play keep away when she brought the ball back. Last nigh,t I finally had a breakthrough. I began giving her a treat every time she would bring the ball back, then, I taught her to drop it at my feet, and then sit. I also began shouting “Come” sometimes while she was chasing the ball, and as soon as she ran to me I would deliver a treat. Now, she drops whatever she’s doing and runs right to me when I call her to come. However, last night when it was time to come into the house, I walked up the steps and opened the door. She wasn’t having any part of that and took off running, this time with no lead on; she bolted out of the yard. I tried every command I knew, but the only thing that worked was when I said, “Bye-Bye.” Hearing that word, she charged back into the yard at the speed of light and was in the van in seconds. My husband and I took her for a short ride, put her lead back on of course, and let her have one more run before finally leading her into the house where she was given a special treat. We will continue to work on safe boundaries with her daily until we earn her trust and she willingly comes in the house. Until then, we will always keep a long loose lead in tact, just in case. Training takes time, especially when fostering an abused, wild dog. But establishing safe boundaries are a must for every dog no matter how well trained we think they are. Better to be safe than sorry. Have a safe, good week! 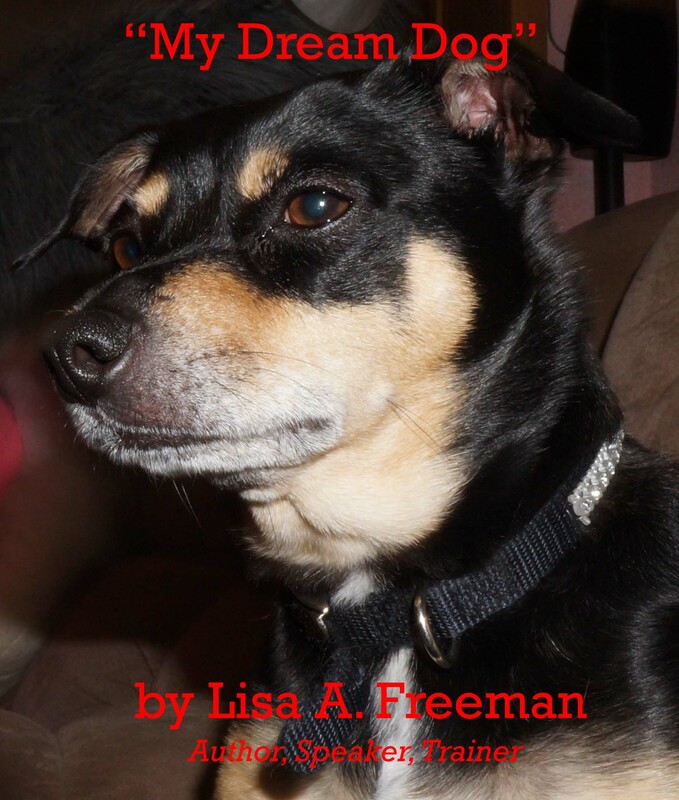 Lisa Freeman is an AKC Evaluator, Dog Trainer, and Certified Pet Therapist from Owosso, Michigan. She rescued her first dog, Snickers over 13 years ago and that dog healed her, her entire family, and so many others. Now, she teaches others through the PAWS that saved, rescued, and healed her! Check out her website, blog, videos and dog training classes @ http://www.dogspawsforhealing.com.